Lecturer in Media at the University of Liverpool. 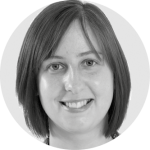 She is also co-Convenor of the PSA Media and Politics Group. Theresa May’s unexpected accession to the Tory leadership after the historic EU referendum means that for the first time since 1987, the next General Election was called and contested by a female Prime Minister. Despite repeated assurances to the contrary, May called the election after formally triggering Article 50 and just eight weeks prior to the opening of negotiations to establish the manner in which the UK would extract itself from the EU. May sought to present herself as a strong and competent leader who would make use of her reputation as a ‘bloody difficult woman’ to negotiate the best deal possible. Despite the highly presidential nature of the campaign and the extent to which the news coverage reflected this in terms of its focus on the two main party leaders (see Harmer and Southern in this volume), the online coverage of this election proved to be difficult for any women who were not politicians (particularly leaders) to receive any news coverage at all. My analysis of five online news sources (conducted with Rosalynd Southern) demonstrates that women accounted for 36.8% of all individuals featured in the news coverage (Figure 1). 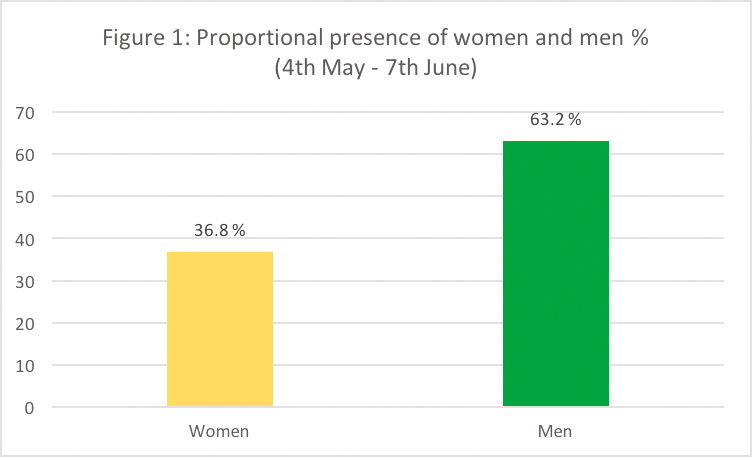 Given the fact that the most prominent politician in our study was the Prime Minister (who appeared in 37.3% of all items in our study) it seems surprising that women still cannot reach parity with male campaigners in news coverage of elections. Looking in more depth at our findings demonstrates that although there were a variety of women politicians who received a good deal of attention, the traditional struggle for other women to be heard was exacerbated by this highly-presidentialised campaign. A breakdown of all political parties and other groups of people who are called upon to comment in news coverage shows which political parties or which groups of sources received higher levels of mediated representation. For the Conservatives, 60.7% of all individual appearances were by a female politician – the vast majority of these were, of course, the Prime Minister herself. Other political parties whose female leaders dominate their parties’ appearances were the Scottish National Party (with 71.4% of their appearances being made by women representatives), Plaid Cymru (77.8% – mostly made up of appearances by Leanne Wood) and the Green Party, for whom 66.7% of outings in the news were made up by women (mainly joint leader Caroline Lucas). 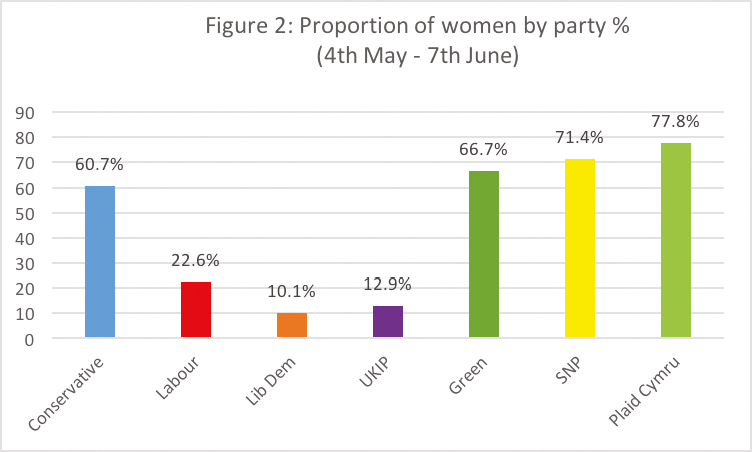 Labour Party sources instead tended to be dominated by men (mainly Corbyn, again reflecting the presidential nature of the campaign) as Labour women only accounted for 22.6% of all appearances by Labour sources. UKIP and the Liberal Democrats managed the fewest women campaigners in online news, accounting for 12.9% and 10.1% respectively (Figure 2). Ordinary women also received lower representation than might be expected given how accessible members of the public are to journalists. Women accounted for 39% of all citizens featured in our study of online news. Women in non-political roles were very marginal in the coverage. 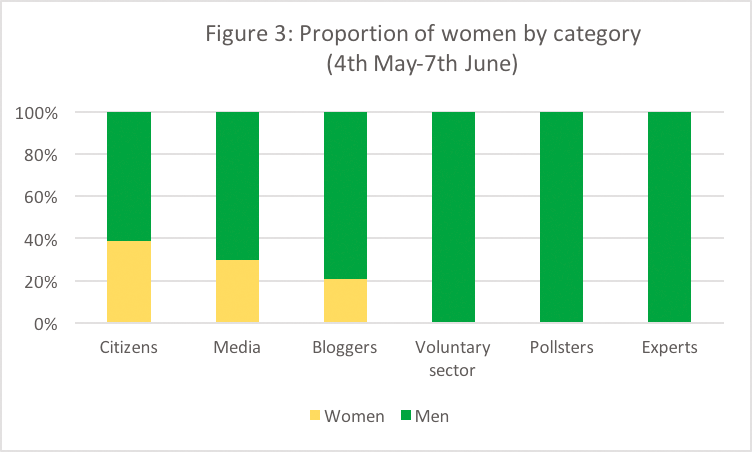 Despite the presence of a reasonable volume of voices from other media and online platforms in online news coverage, just 29.7% of media sources and 20.8% of bloggers referred to were female (Figure 3). Other kinds of sources were completely absent. Every individual pollster or other kind of expert who received any mention or reference in the news was male. This dearth of women’s expertise is also reflected in the authorship of online news items. Just 31.8% of all items with a single author were authored by women. This shows, as with studies of offline news coverage, than online political news is still dominated by male authors. 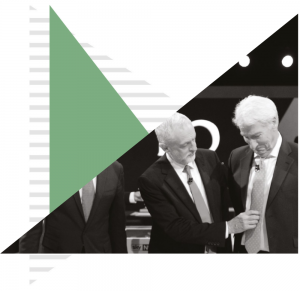 It remains to be seen whether these patterns are a quirk of online news, and whether women experts fared any better in mainstream broadcasting and print coverage will be revealed in time. However, given the increasing importance of online news, this complete erasure of women’s political expertise from the coverage is discouraging. Ignoring women as experts limits the perspectives and range of ideas that are deemed to be relevant to the political realm and serves to reinforce the male dominance of politics, but also impoverishes our understanding of the political process. Although we have a good level of representation of women in key political leadership positions, other women continue to find it difficult to gain access to the news.